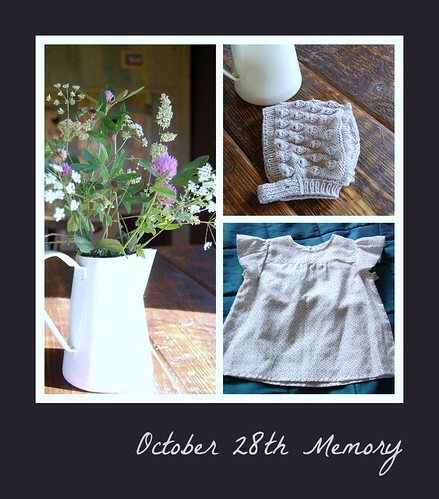 October 28th Memory, originally uploaded by indiaeden. Today is about sharing a significant memory, negative or positive. I'm not ready to share my most significant memories, those are the ones that most haunt me at 3am. I've never even spoken to Woody about them. I don't think I will ever share them, despite a small part of me wanting to make it very clear to all the absolute horror of that morning in hospital. I could share the memories I have of conversations and simple moments where I just knew Florence was safer in my womb than she would be out of it. Instead I'm going to share memories from our family holiday in Hereford just a few weeks before Florence was born. The dress is now in her memory box, never worn, but I can still imagine just how it would've felt over her chubby baby belly, warm skin under soft cotton lawn. That is so vivid to me, and was in the shop when it was hanging on a hanger. When I think of those days, I sing this song in my head.